Stand out from the crowd in the Do You See Me dress! This is the dress that you need in your life! Sitting at a maxi length and featuring a side split, you'll never want to take this stunning piece off! Filter By Height: Show All 5'1" 5'4" 5'9"
Great Quality But Very Glittery!!! The dress is really good quality. Heavy in size and a bit tight but sturdy quality. Highly recommended however, just letting you know now, there will be glitters everywhere! Looked like there was a glitter bomb where I sat/stood mostly! Pulled it out of the bag and glitters went everywhere on the floor on your body! very poor quality the mesh doesn't even align with the dress! Imagine wearing this dress you'll have trail of glitters everywhere! and the glitters are multi colour doesnt look exactly as what is being shown in the photo! Tried contacting their happy team to tell me to spray hairspray to avoid fall out! what a joke! 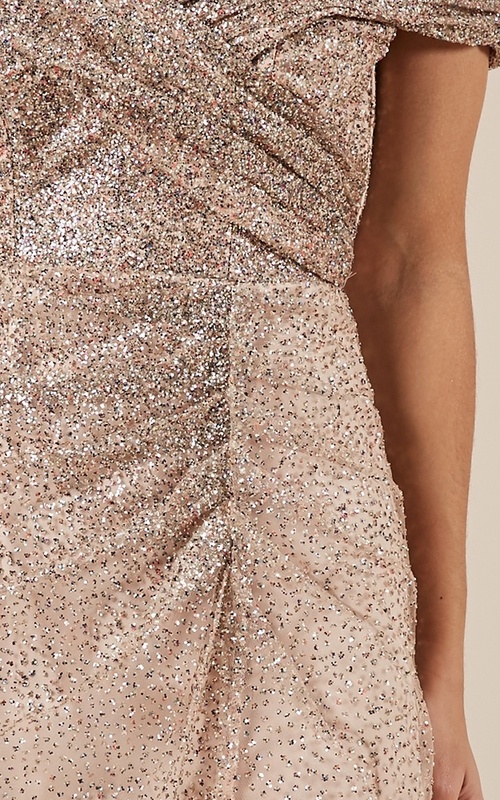 I received this dress and the glitter was EVERYWHERE, I did expect some fallout but not to this extent. The glitter wasn’t even rose gold at all, it was all multicoloured. The quality of the fabric was also very poor, very obviously manufactured in Asia with a cheap Asian tag. I would not recommend.